When I summon up images from my early years, they seem at once comforting and alien, like stills from a G-rated David Lynch film. There’s the bulky mustard-yellow telephone affixed to the wall of our kitchen, with its rotary dial and long, coiled cord. There’s my dad fiddling with the rabbit ears on top of the TV, vainly trying to get rid of the snow obscuring the Reds game. There’s the rolled-up, dew-dampened morning newspaper lying in our gravel driveway. There’s the hi-fi console in the living room, a few record jackets and dust sleeves (some from my older siblings’ Beatles albums) scattered on the carpet around it. And downstairs, in the musty basement family room, there are the books on the bookshelves – lots of books – with their many-colored spines, each bearing a title and the name of a writer.
. An important writer and thinker, and someone who sees through a lot of the hype. This looks like a good read and reminds me of Neil Postman’s “Amusing Ourselves to Death.” I will need to check it out. If you haven’t read it, go to Amazon and read the first review for an excellent summary. 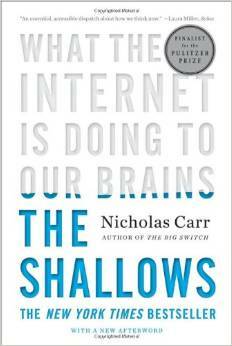 Interestingly, it indicates that this book is frequently purchased with Mr. Carr’s book. But don’t order it from Amazon. Instead, buy it from your local independent bookstore.